Saratoga's Alicia Follmar didn't just finish first in the Lynbrook Invitational last week, she set a new record on the 2.1­mile course in 11:50.1. 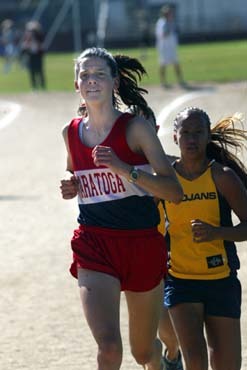 Jason Yow of Monta Vista and Alicia Follmar of Saratoga raced to victories last Thursday at the Lynbrook Invitational. Yow, a junior, raced to a 10:29.5 on the 2.1­mile course on the school's San Jose campus to win the boys varsity race and Follmar, also a junior, set a new course record on her way to an 11:50.1 in the girls varsity division. Saratoga junior Hari Subramaniam finished second to Yow in 10:59.8 with Monta Vista sophomore Scott Russell third in 10:53, Lynbrook senior Luis Jensen fourth in 10:59.3 and Monta Vista juniors Mast Paquet (11:03) and Elliot Jones (11:06.3) fifth and sixth, respectively. Cupertino junior David Rabinowitz was ninth in 11:14.1 with sophomore Kevin Schneider of Fremont 13th, Saratoga senior Steve Surrette 14th and Saratoga soph Ken Douglas 17th. Also finishing in the top 25 were Henry Barmeier of Saratoga (21st), Dennis Campos of Fremont (22nd), Jason Whitsett of Lynbrook (23rd) and Xi-Lin Yeh of Cupertino (25th). Follmar set the pace in the girls varsity race with Lynbrook freshman MayC Huang second in 12:30.4 and Homestead frosh Jill Peanasky third in 12:31.1. Monta Vista senior Dana Underwood ran fourth in 12:39.8 with freshman Angela Hsu of Monta Vista fifth in 12:40.6, Cupertino freshman Julianne Hansen sixth in 12:47 and Lynbrook senior Aya Wakabayashi seventh in 12:51.8. Monta Vista runners finished ninth through 13th with Jill Blake-Burke, Stephanie Chan, Connie Shieh, Lisa Worsham and Judy Liang finishing one after the other. Rachel Foust of Saratoga was 17th, followed by Rebecca Boyle of Homestead (18th) and Christina Liao (19th) of Lynbrook, Sasoon Kim of Lynbrook (21st), Josie Chan of Saratoga (22nd) and Chelsea Young of Saratoga (23rd). Fremont's Elijah Carillo was first in the boys frosh-soph event with Justin Bahng of Monta Vista second.